Sharing the wiring instructions for a 2014 Accord, not push to start models. Viper 5706V 2-way with LCD remote. This combo handles all models of Accord (smart key or non). The non-PTS models are Install Type 8. Start by comparing the list for the Interface with the list for the Alarm. Note all of the features that a D2D interface will provide for you. 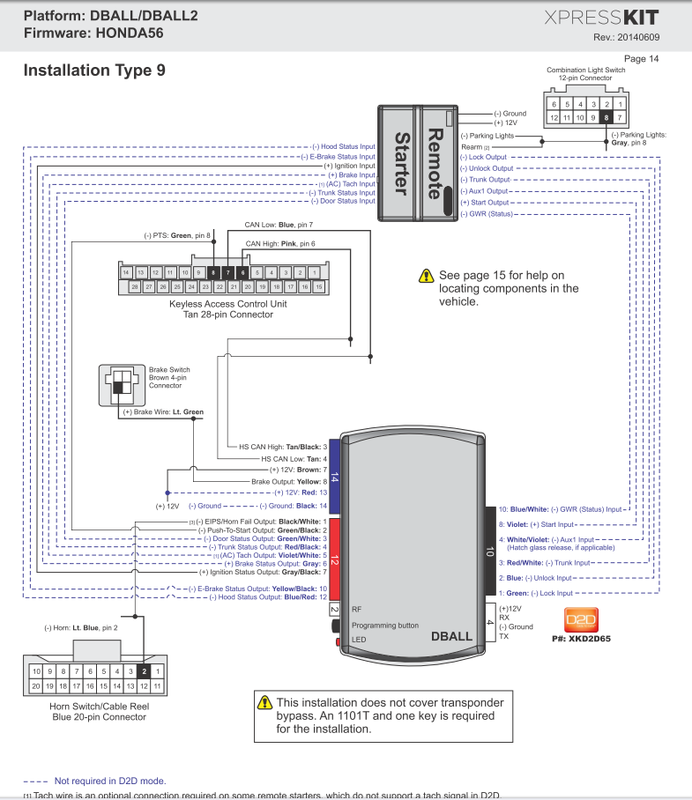 The D2D interface communicates via CAN Bus to eliminate most of the wiring connections needed. All of the connections dashed blue are not needed thanks to D2D. Note that 4-pin harness is the D2D harness to the alarm brain, it handles power, ground, and data. You need to sacrifice your grey valet key (no buttons). You wrap wire around the key and around the cylinder... but that's easier said than done. So i used laminated wire from a small inductor and soldered that to the wiring from the Interface. I disassembled the key cylinder cover and wrapped the thin wire around the outside of the clear piece. I used thin strips of electrical tape to hold it in place. be sure to tape/heatshrink the connections to fully protect them. This photo is for demonstration, i extended the wiring to the key to hide it deeper in the dash. you will notice that the immobilizer housing has an arm with a hole in it - a small Phillips screw is located here, it's not easy to remove. a metal bracket held with two 10mm bolts has the main wiring harness wire clips in it - remove that and you have more access to the screw. You can intercept CAN Bus wiring at the steering column also. bottom trim is held with one phillips screw in the middle and two phillips screws up top - rotate the steering wheel to gain access to them. The lock and unlock wiring is also easily accessed in the driver's door harness - it's located where the rubber boot passes wiring to the door. That completes vehicle wiring for the Xpresskit. Next we wire the 5607V brain. 5 WHITE PIN 30 of LIGHT FLASH RELAY - can be + or -. I set to + and intercepted a red wire in large green harness (see pic). - connection is a gray wire at steering column harness. 6 ORANGE 500 mA GROUND WHEN ARMED OUTPUT - I tied this to a Tilt sensor orange wire, otherwise not used. All connections made to green heavy gauge harness below dash or at steering column. ** Program Viper 5607V Menu 3, Item 8 to Option 2 for Flex Relay = Accessory 2. *** Cut the Blue wire. This is the only wire you need to cut. This is the starter interrupt function. Last edited by papacueball; 10-22-2014 at 03:09 PM. Hopefully this will save some people some time. It wasn't immediately clear if i had to cut the factory blue wiring for starter input/output because the Xpresskit says it handles starter output. I found some info, but nothing specific for the non-PTS models. I got the 5706V online for around $220. I got the Xpresskit DBALL2 from my local dealer for $80 and they programmed it free of charge. without the tilt sensor, the only wire i needed to connect in the large 24-pin harness is grounding the black/white wire. I bundled the rest but did save the aux outputs for future use. 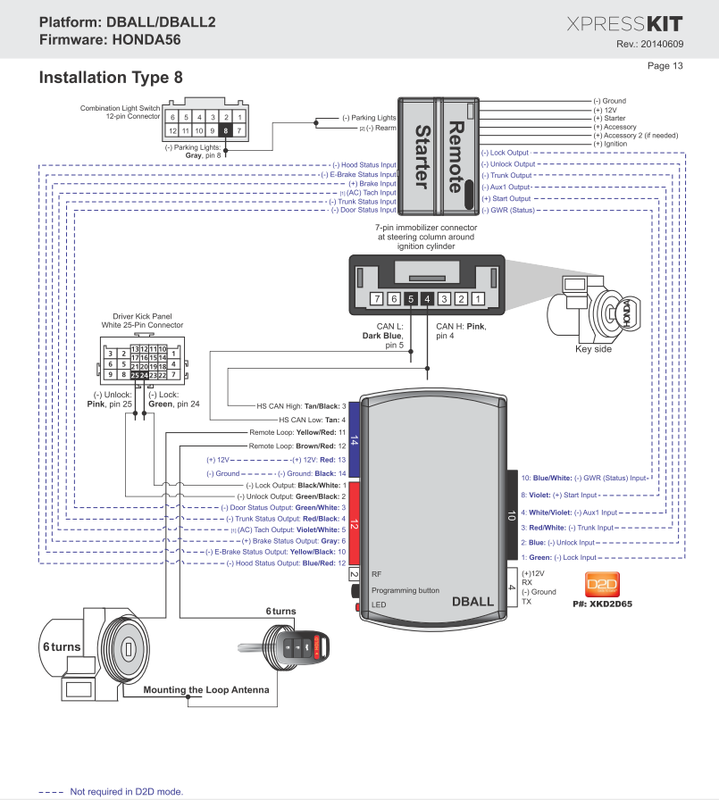 Others have said that using the iDataLink interface eliminates the need for wiring a key. I've used iDataLink before with good success. I went with Xpresskit because they are also made by Directed (same as Viper) and I figured the D2D would be more seamless. It appears that the Xpresskit is much easier to program as well. Below are features retained by D2D and the final programming method (4 steps in gray - white is done by dealer). I had an issue where the car would start on RS but then shut off after 20 seconds or so. it would then attempt to restart twice (no fire). then it would give up and just tell me "remote start off" on my key fob. it wasn't all of the time but most of the time. it would also sometimes fail to keep the car running in "pit stop mode". you can do diagnostics on the last remote start shutdown (refer to install manual) and it told me low voltage (voltage mode). I did some digging and the solution is in regards to the tach. I had it programmed for virtual tach. it looks at voltage and expects to seen an increase in voltage. but this car regulates voltage at 12.5VDC when the headlights are off (possible ELD). so the car would start and the voltage would be the same and the 5706V thought the car wasn't running. i'm not sure why it failed to restart. I reset the virtual tach. I changed the programming from Virtual Tach to tach. I performed the tach learning procedure. The system confirmed it learned the tach through D2D. car seems to start fine now. all of it makes sense. The Hardy Boys and Nancy Drew would be proud. Well done.